The thought of changing eating habits to a Primal style is frightening to a lot of people. Change in general is frightening, but even more so when it goes against the message that has been promoted by our food guides and marketing campaigns built around the food industry. The idea of completely eliminating foods we have become dependent on is uncomfortable to say the least, which is why a common to resistance to Primal eating is that it is okay to eat anything as long as it is done in moderation. Similarly, even those with the best of intentions trying to adopt new habits are lured by the thought that they can periodically “cheat” and revert back to their comfort foods. Even the top advocates of the movement recognize that it is impossible to eat this way 100% of the time. Guidelines for deviating from the plan exist in different forms – 80:20 rules, 95%-5% rules, free choice weekends, once a week cheat days, etc. A common crutch phrase from resistors is that they believe in eating “everything in moderation.” While good in theory, the problem comes from practicing moderation. Most of us fall short when it comes to actually exercising the self-control necessary to achieve true change, especially if an escape route is available. We become too willing to bring out “everything in moderation” as a way of justifying things to ourselves. In university I had a friend who started smoking, but “only when she drank.” The problem was that she was going out to the bars 4-5 times a week! She was a smoker, but refused to admit it because the smoking only occurred for short periods a few times a week. The problem can be worse with dietary changes. While cigarettes are one item, dietary changes involve giving up bread, pasta, sugar, processed foods, alcohol, and more. Cheating 1-2 times a week with each item can add up to double digit deviations. Think about owning a “moderation card,” similar to a credit or debit card. How much action are you putting on that card per day? Per week? Per month? Running late! Quicker to grab 2 pieces of toast with almond butter than to cook up an omelette. That’s okay though, everything in moderation. Tim’s run! Large coffee (no sugar) and I’ll cash in that free cookie from Roll Up The Rim. I know it’s a cheat, but everything in moderation. Big chicken & veggie salad with avocado, almonds and olive oil dressing. Total Primal, nice! I’ll reward myself with a small slice of the leftover Subway sandwiches from the management meeting. A few squares of dark chocolate before my run. Usually eat 1 row, but I’m feeling a bit hungrier than normal today, so I’ll have 2 rows instead. Steak, cauliflower mash, and grilled vegetables with a glass of red wine. Had a good run, so I’ll reward myself with a 2nd glass of wine and a small scoop of ice cream. Everything in moderation. How do you fare on the moderation test? If you honestly assess your choices, are you using the “everything in moderation” card a bit too often? 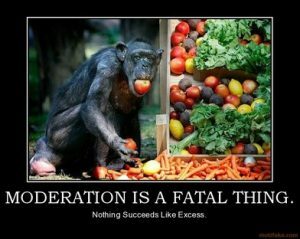 If so, the only things you are getting in moderation are the lean meats, fresh vegetables and good fats that are supposed to be the base of Primal nutrition.